Mermaid dresses are a timeless style. The material's structured fit against the hips, waist, and bust, and the flared skirt at mid-calf create the infamous hourglass figure. Beyond the classic strapless style, Peaches Boutique houses other fashion-forward designs, including cap-sleeved, two piece, and long-sleeved mermaid homecoming dresses. Fabric ranges from fully-embroidered to satin, to simple jersey, to delicate lace with a sheer midriff, and more. Because of its fitted structure, the mermaid style has a slimming effect, making it a popular choice for all body types. Many of these prom dresses also come with a corset lace-up back offer added support and cinches the waist a little more. 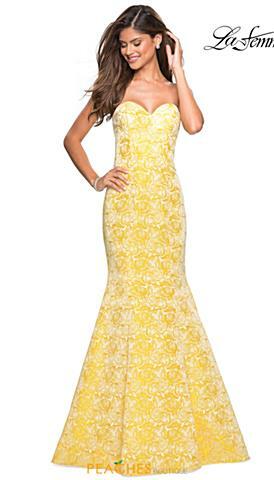 To make sure you get the desired fit, we recommend trying this type of dress on in our Chicago location.